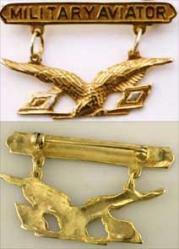 In 1913 the Military Aviator Badge was authorized by Congress and was awarded to 27 or 28 Signal Corp. pilots. This badge is a museum quality reproduction directly copied from the original that was awarded to 2nd Lt.. Hap Arnold the first to be awarded on July 5, 1912. The mold was made with permission of the Air Force Museum in Dayton Ohio under the condition the pin on the back be modern and not an exact museum quality reproduction therefore it does have a pin back but with a different clasp. The pin is made in Sterling Silver with a 24-karat plate. The Signal Flags have been hand chased to show silver as in the original. This is the only museum quality reproduction that is accurately made and is based on the US Government stamping and casting. The original badge was 14k Gold with a 24 karat plate. The Military Aviator bar was die struck but the eagle was cast. An original is estimated to have a value in excess of $25,000.